Astronomer Professor Georg Manfeldt is regarded as a crackpot for postulating the idea of an expedition to the Moon to harvest the plentiful supplies of gold that he believes are there. Wolf Helius, the head of an aeronautics firm, approaches Manfeldt and offers to mount such an expedition. As soon as Helius announces his plans, American Walter Turner, a representative of an international cartel headed by the five most powerful people in the world, steals Manfeldt’s notes and blackmails Helius into allowing him to come along on the expedition. Helius also agrees to take his business partner Hans Windegger and Windegger’s fiancée Friede Velten, whom Helius secretly desires. The rocket is built and launched. They land on the Moon and soon find the plentiful supplies of gold. However, the expedition is endangered by both Turner’s treachery and Windegger’s fearful belief that they will all be killed. 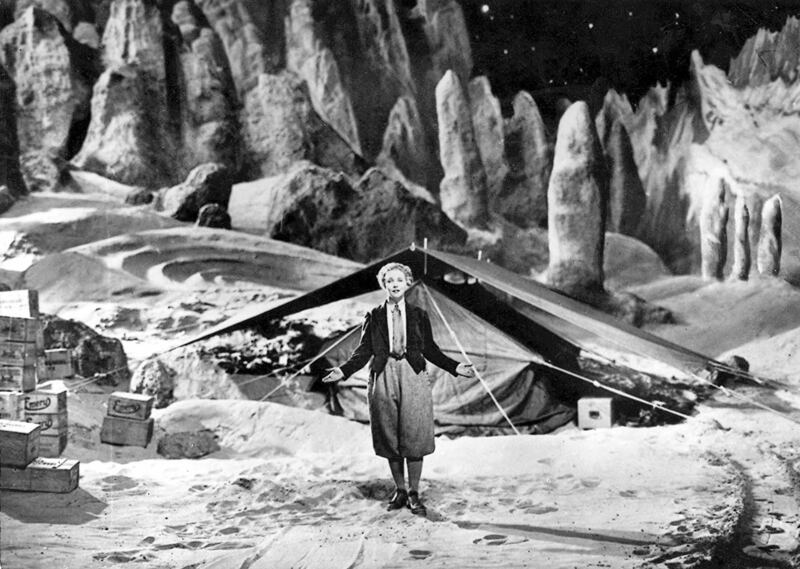 Die Frau im Mond (Woman in the Moon) was the first major screen attempt to broach the subject of space travel. There had been odd attempts before such as Georges Melies’s whimsies A Trip to the Moon (1902) and An Impossible Voyage (1904), the Danish film Heaven Ship/A Trip to Mars (1918) and the Soviet Aelita (1924). Die Frau im Mond was the first effort to concern itself with a serious and scientifically credible space launch. 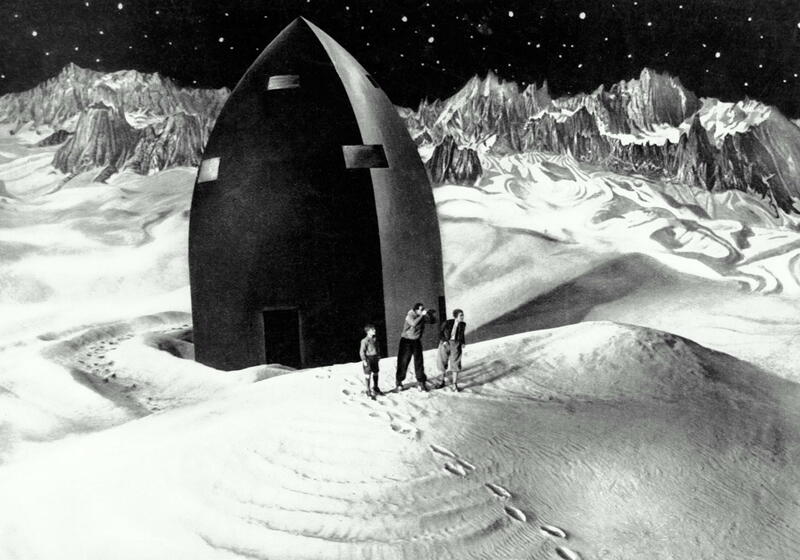 Much emphasis in genre history is devoted to Destination Moon (1950) and its pioneering realism but a good deal of this was done before in Die Frau im Mond and a little later in the even less known Soviet film The Space Ship (1936). Die Frau im Mond was not a huge success in its time, partly in that it was made silent just when sound was arriving and as a result ended up being overlooked. Seen today (especially in the 2000 restoration from the Friedrich Wilhlem Murnau Foundation), it shines as the epic it deserves to be recognized as. Die Frau im Mond was made by Fritz Lang, who had risen up through early adventure films and hit his stride with epics of German silent cinema such as Dr Mabuse, The Gambler (1922), Siegfried (1924) and Metropolis (1927). (See below for Fritz Lang’s other genre films). Lang brought everything to bear on Frau im Mond. He even brought in scientific advisors such as Willy Ley and Herman Oberth, who later became instrumental in Hitler’s V2 rocket program and the early days of the US Space Race. There were plans – which never came to fruition – that the group would launch a rocket to coincide with the premiere of the film. The care and attention shows on screen. They get an amazing amount right, including the need for a rocket to achieve orbital escape velocities, the lower gravity on The Moon and the screen’s first depiction of zero gravity. Woman in the Moon is also uncanny in its prediction of the launch being accompanied by a countdown and is far more accurate than Destination Moon is portraying the worldwide media fascination that such an event would be followed by. The special effects are particularly good, with the film portraying the imposing size of the rocket as it is towed to its launchpad and some lovely travelling matte shots of it dwarfed against the full looming Moon. They are slightly off in predicting that the Moon has plentiful supplies of gold and an atmosphere (something that would have been common scientific knowledge at the time) – the sight of Lunar explorers wandering about in lederhosen and woolen sweaters as though on an Alpine hike is a rather ludicrous one today. It is a surprisingly long film. Lang once commented that he made his films long so that they took up both halves of a double-bill. Most versions of Die Frau im Mond seen in English-language release are cut to 90 minutes and the full-length restoration print seen here runs to a sizable 200 minutes. Lang composes long scenes – some run over ten minutes apiece. It is 90 minutes (over the normal running length of the average film) before we get to the rocket itself – and these are taken up with drawn-out scenes of Helius going to visit the professor, his comic attempts to contact his rival Windegger during his engagement party and Turner’s Machiavellian schemes to get in on the deal. Nevertheless, these scenes grip because Fritz Lang has an often deft sense of humour, particularly the running cuteness of the professor’s mouse or some of the scenes with the boy. Fritz Rasp also makes a wonderfully hissable villain, seeming like a physical embodiment of a rat with his tall obsequiousness and perhaps intentionally Hitler-like cowlick. Woman in the Moon also shows Fritz Lang at the height of his powers as director. His previous films were constructed as epics of silent screen grandeur – Die Frau im Mond is the culmination of all that and yet where Metropolis is sprawlingly indulgent, Die Frau im Mond is superbly restrained. Lang uses the intertitles with an amazing inventivity and in ways that no other director of the silent era ever thought of. When it comes to the countdown the numbers “6, 5, 4 …” come rushing at the screen, each one getting bigger in size; the discovery of gold is accompanied by the world ‘gold’ coming shooting out of the cave; and the radio announcer at the launch is placed inside a montage as though he were surrounded by a tuba out of which the words he is uttering emerge. An amazing film. Fritz Lang’s other films of genre interest are:– Destiny (1921) wherein Death incarnates two lovers throughout various historical periods; Dr Mabuse, The Gambler (1922) concerning a ruthless criminal mastermind; the two-part Niebelungen saga, Siegfried (1924) and Kriemhild’s Revenge (1924), based on the Teutonic myths; Metropolis (1927); M (1931), a thriller concerning the hunt for a child killer; The Testament of Dr Mabuse (1933); the afterlife fantasy Liliom (1933); the film noir psycho-thriller Secret Beyond the Door (1948); and a further Dr Mabuse sequel The 1000 Eyes of Dr. Mabuse (1960).